If Orthodox parents think baptizing their children, bringing them to the Divine Services, and making sure they receive the Holy Mysteries, is enough, they are wrong. The truth is that we deprive our children of the fullness of our Orthodox Faith if we decide they will absorb Orthodoxy by osmosis. If their little selves are in church, but in their restlessness they demonstrate they’d rather be anywhere else but in church, we will have failed them. We may choose to ignore their restlessness in the temple, and dismiss their behavior, even though it is likely distracting other worshippers, but we must admit we wouldn’t allow our children to misbehave in the home of good friends. Nor would we allow them to continue disrupting the classroom, should the teacher bring their bad behavior to our attention. Yet we turn a blind eye to bad behavior that is distracting to other worshippers. 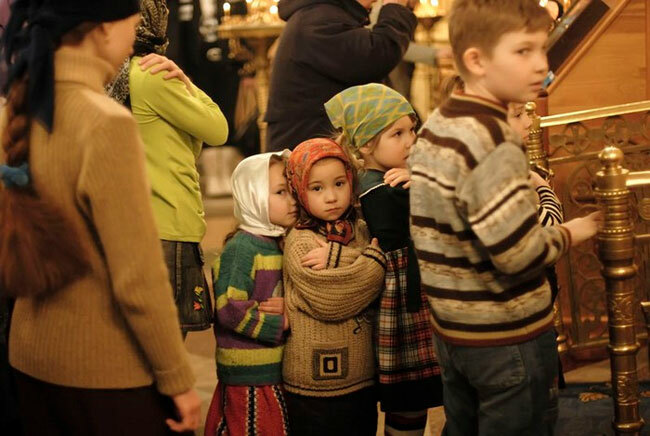 Furthermore, when they are older, children who have not been taught proper behavior in the temple of the Lord, will leave the Church, for they will have never learned to feel the presence of the holy. When they leave Orthodoxy, it is ourselves who will one day be answerable to God for their departure. That the world calls us to indulge our children, and starve their souls while feeding their egos, the Church calls us to allow them to suffer hardship for the sake of their eternal souls. We must not be afraid to allow our children to suffer temporary aggravation, while the world encroaches further into their little lives. It is our responsibility to instruct our children by our example. They must see in our every thought, word and deed, the reality of God, and the holiness of His temple. We must teach our children basic civilized behavior, without which any further education, either secular or religious, will be impossible. If we remember that Divine Liturgy should be the culmination of all the prayer and worship that takes place in the home during the week, we must not allow Sunday to be the only day our family gives a thought to God, for to do so will only confuse them, and the church services will only seem out of place to the rest of their week. We dare not let them think that a show of piety is a once a week practice, for to do so will leave them without a personal faith of their own. A child may see that expanse of carpet in the temple as nothing different then the space in front of the TV at home, but we parents must instill in them, at the earliest opportunity, the importance of that sacred place, and impart to them, out of love, a sense of reverence and attentiveness to the presence of God. 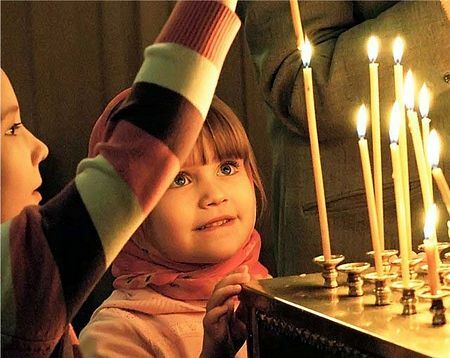 And, for the sake of other worshippers, we must do our very best to discourage any behavior in our children that leads our fellow Orthodox Christians to distraction. Each parent needs to determine at what point their child has become too noisy, and consider removing them for a short time. Furthermore, a parent must not expect other worshippers to take care of their child. As well, parents must not allow their children to speak to, or play with, other children, while in the service. They need to be taught, at a very young age, that the Liturgy is the place we find love and joy, collectively, while focusing on the holy. Every parent should be aware that success with our children’s good behavior in church, has it’s roots in the practice that takes place in the home. Evening prayer, as a family, before our home icon corner, is the perfect place where children learn to stand and be quiet and reverent. Explain that your home icon corner is like a “branch” from the main altar at church, and that that altar deserves even more respect. There are relics embedded in the wooden cross under our altar, and it has been consecrated by our Bishop, who told us that an angel stands there constantly in worship. We adults, as well as our children, need to treat the church, and especially the altar area, with great respect. Our children may object to our churchly expectations, but they learn to do many things they don’t want, because parents insist on them: brushing teeth, attending school, doing homework, having a regular bedtime, and not eating cookies before dinner. When parents have a firm reverence for the church and insist on these standards, children will meet them. Icon of the Most Holy Theotokos “O All-Hymned Mother”. 2 For I want you to know what a great conflict I have for you and those in Laodicea, and for as many as have not seen my face in the flesh, 2 that their hearts may be encouraged, being knit together in love, and attaining to all riches of the full assurance of understanding, to the knowledge of the mystery of God, both of the Father and of Christ, 3 in whom are hidden all the treasures of wisdom and knowledge. I feel there is another side of the issue. That the adults should be able to accept that children can’t behave like adults. We’ll have to accept them with their childishness. I believe that’s what Christ meant, when disciples tried to stop them. I remember once going to a Church when my elder child was less than a year old. She made some noise in the Church, and people were looking back at us as if why we’re bringing a child to Church. I agree with you that they should learn discipline. But we need to apply wisdom on how to enforce discipline. We can’t apply it the same way for a 2 year old as we could apply for a 12 year old. We need to teach them to be disciplined in a gradual process. We need to be careful of how much discipline we apply. Too much discipline can make them hate Church and leave it for that reason. We also need to note about two specific challenges for the Orthodox Expatriate Parents. First is that some of our special services are very long. I usually take some colouring book for the young one. I feel that’s better, else they’ll get restless, and make everyone around them too. I feel the long services are a challenge even for adults. But as adults we’ve learned to chant the songs and prayers, even when our heart and thoughts are some where else. Some times I wonder if what we call as discipline is the difference between children’s honesty and our hypocrisy. Secondly, most of our Churches in western countries have English & Native language service. My 9 year old likes the English service but can’t follow the other one. Even if she understands the common words in Native language, the terms used in our communion are beyond her level. Also it’s not easy to understand many customs and practices that have originated from the native land centuries ago. In summary, I agree with you they need to stand well in the presence of the Lord. But it’s a slow and gradual process, more to be led by inspiration than by force. You are raising an important topic today. I also must comment and I completely agree with Praveen. I attended a church in another state where the parents with children were told to sit in the basement of the church where the service was “piped in” so that the children wouldn’t disrupt the liturgy. What a joy it was when I first went to my current church with my infant and 2 year old toddler and was told by the priest and many, many parishioners afterwards at coffee hour that the children were welcome and they were concerned by the stressed look on my face whenever they made a peep! After all, children are the future of the church, and if we make church too “rigid” and unpleasant for them, they won’t enjoy coming. Yes, they absolutely must learn to behave, and they must be taken out when they start crying or acting up or doing anything that disturbs the other parishioners – but we must also try to do things that encourage them to want to be there. Our church provides a coloring page and crayons for the children each week and our priest does a special sermon just for the children, and we have a parish that welcomes the small noises that come with small children with smiles, not frowns. It can be a delicate balancing act to make sure kids learn reverence while preserving their joy – and I think we need to try to do both. Let me also add that when my kids were little, I remember talking to my priest with another mom because we both felt so stressed out and horrible after being in church on the days when our husbands had to work after going in and out with kids who were misbehaving and constantly trying to teach them how to act in church. He had some wise things to say. He told us that this wasn’t our time right now – that it was our kids time – and that it was more important to bring them every week and teach them that this is what we do, and that eventually they would learn how to behave and we would find that we could actually pray and find peace in church again one day in the future! He also told us that our feelings were very normal. It was so comforting to hear, and it proved to be true!